You and your guests will love this sophisticated 2BR/2BA condo in South Padre Island's entertainment district. Modern furnishings and appliances add to the cosmopolitan atmosphere, and a patio area out back offers a shared pool, hot tub, and kiddie pool, plus fenced privacy. The large, modern kitchen will delight the culinary-minded folks in your party, and two peaceful bedrooms offer space for four guests. Traveling with a large group? 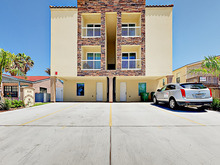 Ten other units in the complex can be rented together for additional accommodations. A prime South Padre Island location puts you right in the center of the entertainment district and a 2-minute walk from the beach. An open-concept main living space greets you — sink into a creamy white love seat or perch on a plush window seat. A 40” flat screen lets you unwind with your favorite shows at the end of a day exploring the Island. The kitchen inspires with stainless steel appliances, dramatic cabinetry, and everything you need to fix beach snacks and gourmet meals. A sweet and simple dining area seats four. Outside, a shared patio offers loungers for soaking up the sun, a table and chairs for outdoor meals and drinks, plus a swimming pool, kiddie pool, and hot tub. This breezy outdoor space is fenced for privacy. The master bedroom boasts a queen-size bed outfitted with patterned linens, a 32” flat screen, and a walk-in closet. The en-suite bath features a glass-door tub/shower combination. In the guest bedroom, two twin beds are styled with plaid comforters and dark headboards, and fun nautical accents dress the walls. The guest bath features a spacious walk-in shower with intricate tile work. Amenities include reserved parking for two cars (parked in tandem), a washer/dryer, and complimentary Wi-Fi. If you're traveling with a larger group, inquire about the other ten other in-complex units. This condo is just a 2-minute walk from the Gulf, which means you’ll be splashing in the surf in no time. When you’ve had enough of the sand, head back and unwind by the on-site pool. Relax on the lounge chair with a book, soak in the hot tub, or play with the little ones in the kiddie pool. You’re right in the heart of the South Padre entertainment district, so whether you want to enjoy a quiet dinner or check out the nightlife, everything is a quick walk away. Louie’s Backyard is a casual surf ’n’ turf spot—and when the lights go down, you can dance the night away. Laguna BOB is a great place for seafood and burgers on the water. Both are a 7-minute walk away. Adventurers can check out SPI Activities (2-minute walk), where you can rent bikes, kayaks, paddleboards, and more. And Schlitterbahn Waterpark is just a 2-mile drive. For groceries and supplies, there’s Blue Marlin Supermarket, a 6-minute walk. This property is registered with the City of South Padre Island Permit No. 201.